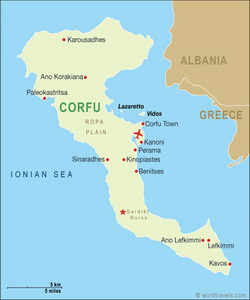 Corfu Airport: Flying to Corfu , for most Europeans, is an easy flight lasting less than 3 hours. Corfu's International airport (Kapodistrias) is located on the edge of Corfu (Kerkyra) town, it is modern and compact. During the summer months (May to October) there are regular charter flights from most European countries to Corfu. Domestic flights (from Athens) operate all year round. From Athens to Igoumenitsa by bus, then from Igoumenitsa to Kerkyra or Lefkimi by Ferry-Boat. There are daily departures from Athens Bus terminal (KTEL, 100 Kifissou str., Athens) to Corfu. Tickets are should be bought in advance if you want to be assured of a seat. The distance from Athens to Igoumenitsa is about 500 km and the trip lasts 7-8 hours. From Igoumenitsa you must take the Ferry-Boat to Corfu Town or Lefkimi. The distance is 18 n.m., and the trip lasts 1h 45min and 1h 30min respectively.